You forgot to download Peytalk Messenger	. Click the link below to download it. As the name points out, Peytalk Messenger is a messenger application. This means you can use the application to interact with other Peytalk Messenger users. You can interact via instant messages, via voice chat, via web cam, or via chat rooms. Conversations can be spiced up by using smiley icons. Files can be sent to other Peytalk Messenger users. 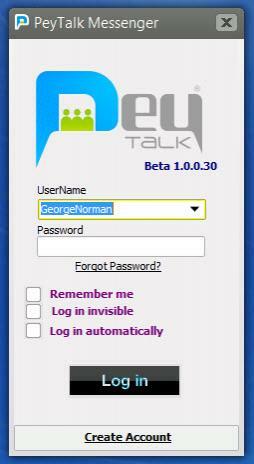 To get started with Peytalk Messenger you will first have to install the application on your PC. To install Peytalk Messenger you need only follow the instructions presented by a setup wizard; said wizard shows up after you download and run the Peytalk Messenger installer. After that you will have to sign into your Peytalk Messenger account. Don’t worry; creating an account is a very simple matter. The interface is just what you would expect from a messenger type application: a list of contacts, a panel at the top that allows you to set a status message, view your profile pic, and so on. Anyone who has ever used a messenger type application in the past will immediately feel at home – which is quite nice. The functionality is just what you would expect from a messenger type application too. Here’s a quick look at the main things you can do with Peytalk Messenger: communicate with other Peytalk Messenger users via IM; voice and video chat are supported; file sharing is supported; manage a list of contacts; join a chat room and socialize with people who share your interests; spice up your conversations by using smiley icons; and more. Peytalk Messenger is available as a Free Service, Extra Service, Deluxe Service, VIP Service, VIP Plus Service, Special Service, Extreme Service, Relux Service, Extra Room Service, Deluxe Room Service, VIP Room Service, and Special Room Service. Peytalk Messenger Free Service has the following to offer: black color, add 100 users, join 2 chat rooms at a time, view 2 webcams, full mode video. Quickly install Peytalk Messenger, easily create and sign into your account, and then conveniently socialize with other people. Installing Peytalk Messenger is an effortless task. Creating a new account is an effortless task as well. The interface is just what you would expect from a messenger type application. The functionality is just what you would expect from a messenger type application too. Lots of Peytalk Messenger services are available. You can download Peytalk Messenger free here.